Usama Dakdok Publishing is an independent publishing company that specializes in the publication of material that equips Christians to be effective witnesses of Jesus Christ . Scroll this page to see All books now available in print. More will be added as they become available. The Generous Qur'an - An accurate, modern English translation of the Qur'an, Islam's holiest book. Why do Muslims terrorize and hate Jews, Christians, and others? The true answer has been suppressed by Muslim leaders and by some in the media. Many believe that terrorists are just extremists or Islamic fascists, but a simple reading will reveal that the Qur'an itself is the source of terror. Islam is continually touted as "a religion of peace," yet the Qur'an itself does not call for peace. Indeed, "Islam" does not mean "peace," but rather "submission." Western Muslims only speak of "peace" because they do not know what the Qur'an truly says, or they do not presently have "the upper hand." Listen to what the Qur'an itself commands and consider it well. 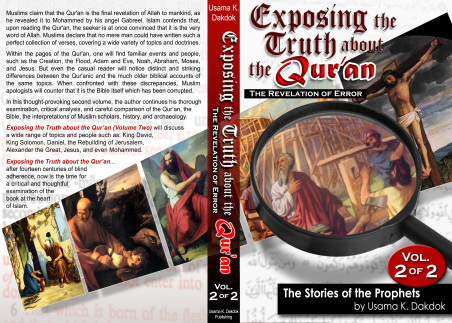 This new book reveals the errors in the Qur’an concerning the stories of the prophets as told by Mohammed. It is a one of a kind English translation that exposes the true nature of Islam's most holy book. Order Here This will take you to The Straight Way of Grace Ministry order page to make your selection there. For International orders you will have to select from the menu when ordering. Book Price: $24.95 US dollars includes shipping and handling within the US. For International rates you will have to select from the menu when ordering. Click here to order $9.99 This link will take you to Smash Words for book download. Muslims claim that the Qur’an is the final revelation of Allah to mankind, as he revealed it to Mohammed by his angel Gabriel. Islam contends that, upon reading the Qur’an, the seeker is at once convinced that it is the very word of Allah. Muslims declare that no mere man could have written such a perfect collection of verses, covering a wide variety of topics and doctrines. Within the pages of the Qur’an, one will find familiar events and people, such as the Creation, the Flood, Adam and Eve, Noah, Abraham, Moses, and Jesus. But even the casual reader will notice distinct and striking differences between the Qur’anic and the much older Biblical accounts of the same, topics. When confronted with these discrepancies, Muslim apologists will counter that it is the Bible itself which has been corrupted. In this thought-provoking new book, the author will examine and refute these claims through careful comparisons of Qur’anic, Biblical, historical, and archaeological records. The reader will discover that the Qur’an does not even agree with itself concerning the lives and actions of the prophets, and is completely at odds with the much older Biblical accounts.Finally, the writer will highlight another key area which refutes a divine origin for all of Mohammed’s so-called revelations: mistakes and contradictions, Exposing the Truth about the Qur'an will discuss the many hundreds of geographical, historical, moral, theological, legal, scientific, and linguistic errors contained in Islam’s holiest book.Finally, the writer will highlight another key area which refutes a divine origin for all of Mohammed’s so-called revelations: mistakes and contradictions, Exposing the Truth about the Qur'an will discuss the many hundreds of geographical, historical, moral, theological, legal, scientific, and linguistic errors contained in Islam’s holiest book. To watch a video about this book click here. 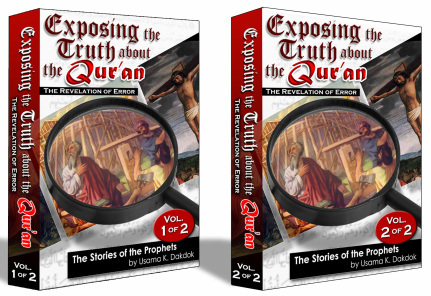 Exposing the Truth about the Qur'an (Volume One) will discuss a wide range of topics and people such as: Creation, Adam, Satan, Noah, Abraham, Lot, Ishmael, Isaac, Joseph, Job, Jonah, Moses, Joshua, and Elijah. Book Price: $24.95 US dollars includes shipping and handling within the US. For International rates you will have to select from the menu when ordering. The menu also gives you the option to order vol. 1 and vol. 2 as a set for a reduced price. This link will take you to Smash Words for book download. In this thought-provoking second volume, the author continues his thorough examination, critical analysis, and careful comparison of the Qur'an, the Bible, the interpretations of Muslim scholars, history, and archaeology. Volume Two will discuss a wide range of topics and people such as; King David, King Solomon, Daniel, the Rebuilding of Jerusalem, Alexander the Great, Ezra, Jesus, and even Mohammed. Sales of this book are not handled by Usama Dakdok Publishing and we are not responsible for deliveries or refunds. This is a true story!The hate that fueled the horrors of the holocaust continued to burn long after the allied victory. The ravages of racism in post-wartime europe reduced the daily life of little Yona Leviniowska to a pitiful and miserable existence. It was against this dark backdrop of bigotry that a glimmer of hope arose. Follow her journey as she travels to the newborn nation of Israel, searching for love and a sense of belonging, amid crushed dreams, and even cruel medical experiments. Seeking to survive by performing at night clubs, and eventually marrying a Muslim out of sheer desperation. Yona barely cheats death time and again. Helped by a kind Rabbi, Yona eventually emerges victorious, against all odds, aided by a supernatural power... Her life just may change yours. The contents of this book are intended to give the reader a better understanding of the doctrines of Islam and their effect on the free world. . It's an in-depth study showing the deception of Islam and those who are behind it, who are trying to fool the westerners with what is called the miracles of the Qur’an. Is it true what the ones who lived and lives in the White House have said? Is Islam a great and peaceful religion? The Issue between Israel and Muslims, should Israel exist or is it the land of Hamas?! Proves from the Qur’an and Allah words that Israel is the land of Jews. Christian and Jewish rights, under the rules of Islam. Atheists, gays, lesbians. With careful study, Islam shows scientific, historical, and logical errors as well as mistakes that expose the false claims about scientific miracles in the Qur'an, plus great details about women's rights. Can slavery ever truly be abolished while such a despotic religion is allowed to prevail in the world? Can such a religion be tolerated alongside other faiths? The author has gone to great lengths to give you an insight into the dangers of complacency with regards to this aggressive belief system. There are very clear indications that the free culture we enjoy is not acceptable in the Muslim faith. This book highlights those threats and gives a better understanding as to why we must take positive action to protect our cultures, faiths, and our nations. To believe that ignorance is bliss, is to invite the disassembly of our way of life, and to leave a foreboding legacy to our children. If we fail to address and challenge this violent religion, we fail to preserve freedom for future generations, and bring shame upon those who fought and died to win that freedom.